Inventor of the "T"-Rail and Railroad Spike. Three-and-a-half decades before the Pacific Railroad established the first rail link between California and the Mississippi, prolific marine and railroad engineering pioneer Robert L. Stevens (1787-1856) — the man who invented and developed (see below) both the "T"-rail and hooked railroad spike still in universal use today — established an equally daring and important first railroad connection between the then two most important commercial and population centers of the young nation, Philadelphia and New York. Chartered by New Jersey in 1830, his Camden & Amboy Railroad was built in conjunction with partner Commodore Robert F. Stockton’s canal company joining the Delaware and Raritan rivers. (The two companies soon formally merged and became what was commonly known as the “Joint Companies.”) The rail line, located entirely within New Jersey, was connected from its terminals at Camden and Perth Amboy to Philadelphia and New York respectively by the company’s own steam ferry boats. By the time the canal and railroad were both completed in 1834, a trip between New York and Philadelphia had been cut to about nine hours. 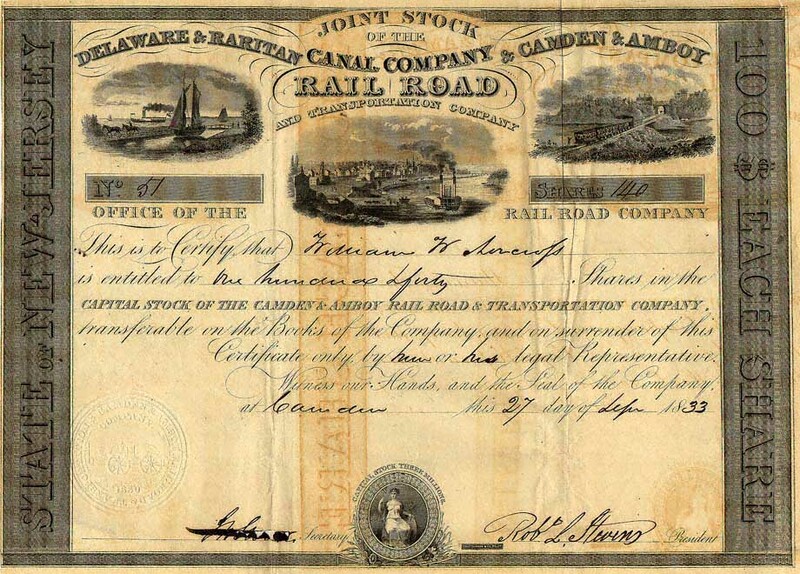 Illustrated here are two very early and extremely rare certificates of “Joint Stock” of the Delaware & Raritan Canal Company & Camden & Amboy Railroad and Transportation Company each of which is slightly different in form. 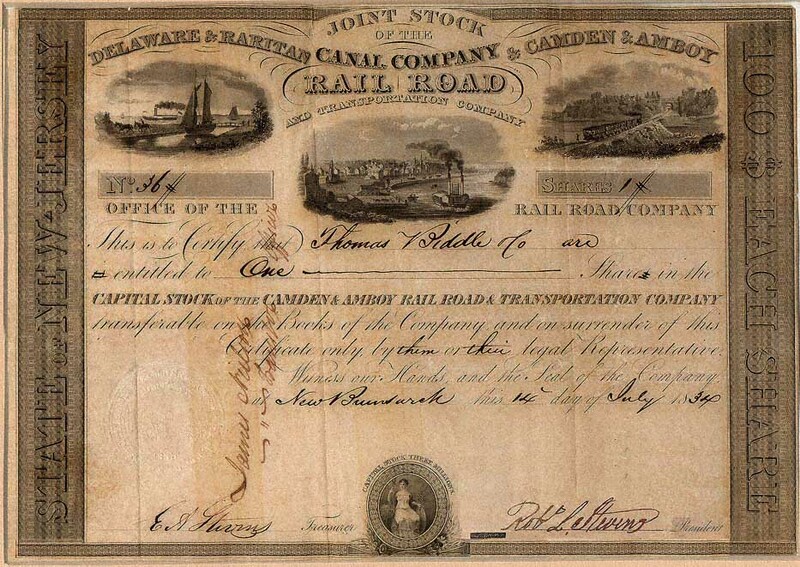 The certificate shown above (#51) for 140 capital shares (representing a very considerable individual investment at the time of $14,000) was issued at Camden, NJ, on September 27, 1833. It is signed by Robert L. Stevens, and Jeremiah H. Sloan, Secretary (pen canceled signature). The other certificate appearing below (#36) for one capital share made to the Thomas Biddle Co. was issued at New Brunswick, NJ, on July 14, 1834. While it is also signed by Robert L. Stevens, the second corporate signature is that of his brother, Edwin A. Stevens (1798-1868), the Treasurer of the “Joint Companies.” (In 1867 E.A. Stevens founded and endowed the still flourishing Stevens Institute of Technology in Hoboken, N.J. The “Joint Companies” were both operationally and financially extremely successful and for very good reason — they operated as state sanctioned monopolies! In exchange for the payment of heavy transportation taxes, stock dividends (which were never less than 6% and sometimes reached 30%! 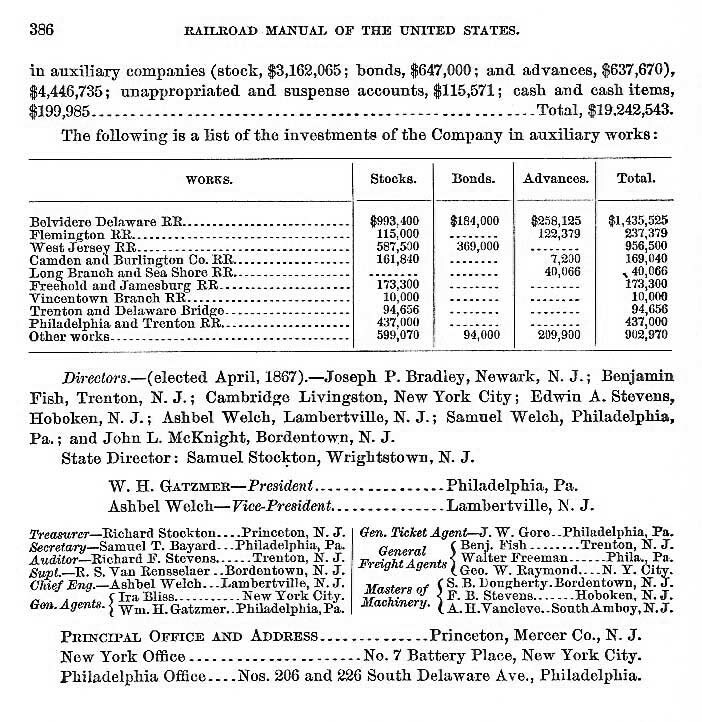 ), and other considerations, New Jersey had granted a charter which gave the “Joint Companies” an absolute monopoly within New Jersey for rail and canal transportation between Philadelphia and New York. This, of course, greatly disadvantaged both passengers and shippers (who in fact “paid the freight” for this deal in inflated tariffs) and potential competitors, but as the state reaped anywhere from twenty to twenty-five percent of its total income from its arrangement with the “Joint Companies” the legislature was in no hurry to provide relief to those who wanted to break their monopoly. 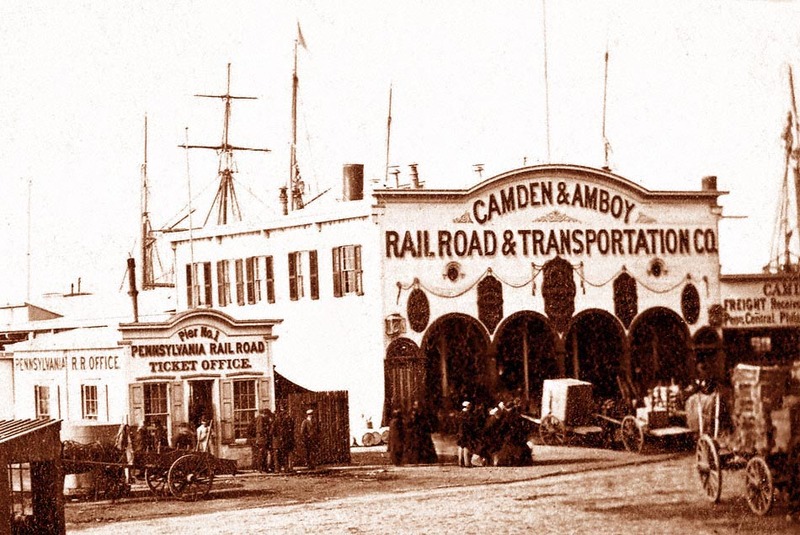 The Camden & Amboy eventually became a part of the Pennsylvania Railroad which acquired it by lease in 1871. About this time the state legislature also ended the forty year monopolistic grip of the "Joint Companies." 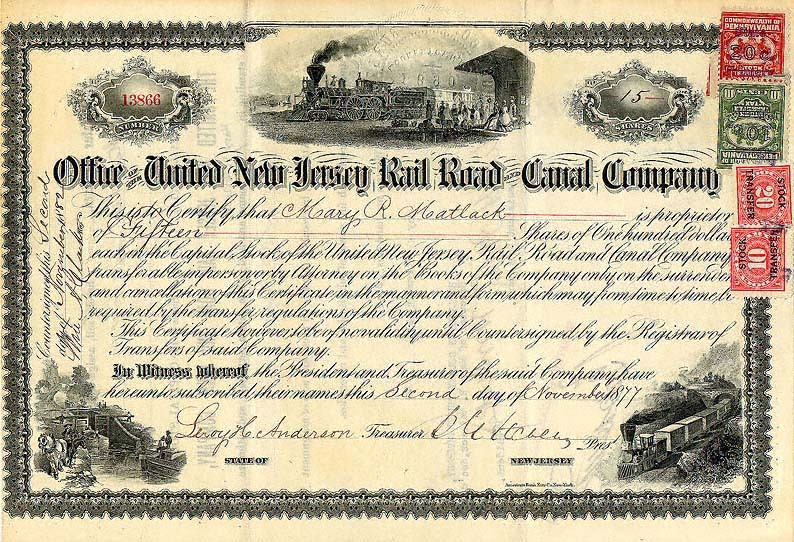 On May 18, 1872, the "Joint Companies" consolidated with the New Jersey Railroad and Transportation Company to form the United New Jersey Railroad and Canal Company. In May, 1881, Francis B. Stevens, a nephew of Robert L. Stevens, wrote the following letter relating the elder Stevens’ development of the “T”-rail and hooked railroad spikes a half-century earlier. It was included in the Census Report for 1880 in the section relating to the area of iron and steel manufacture. HOBOKEN, NEW JERSEY, May 31, 1881. In answer to your letter of the 27th instant 1 will say that I have always believed that Robert L. Stevens was the inventor of what is called the “T”-rail, and also of the method of fastening it by spikes, and I have never known his right to the invention questioned. “The rail of the Liverpool and Manchester Railroad, on its opening, in September, 1830, was of wrought iron, divided into fish-bellied sections, each section being supported by a cast-iron chair, to which it was secured by a wooden wedge. The form was derived from the old cast-iron fish-bellied train rail, cast in single sections, each about 36 inches long. This wrought iron rail was afterwards improved by making its bottom straight uniformly throughout its length. Mr. Stevens' invention consisted in adding the broad flange on the bottom, with a base sufficient to carry the load, and shaped so that it could be secured to the wood below it by spikes with hooked heads; thus dispensing with the cast-iron chair, and making the rail and its fastenings such as it now is in common use. In the year 1836 and frequently afterwards he spoke to me about his invention of this rail, and told me that in London, after unsuccessful applications elsewhere in England, shortly after the opening of the Liverpool and Manchester Railroad, he had applied to Mr. Guest, a member of Parliament, who had large rolling mills in Wales, to take a contract to make his rail for the Camden and Amboy Railroad, of which he was the chief engineer; that Mr. Guest wished to take the contract, but considered that it would be impracticable to roll the rail straight; that, finally, Mr. Guest agreed to go to Wales with him and make a trial; that great difficulty was at first experienced, as the rails coming from the rolls curled like snakes, and distorted in every imaginable way; that, by perseverance, the rail was finally successfully rolled; and that Mr. Guest took the contract. The Camden and Amboy Railroad, laid with this rail, was opened October 9th, 1832, two years after the opening of the Liverpool and Manchester Railroad. Of this I was a witness. Camden & Amboy Railroad Dock, and Pennsylvania Railroad Ticket Office, Pier No. 1, New York City. Stereoview detail. This rail, long known as the old Camden and Amboy rail, differed but little, either in shape or proportions, from the “T”-rail now in common use, but weighed only 36 pounds to the yard. For the next six or eight years after the opening of the Camden and Amboy Railroad this rail was but little used here or abroad, nearly all the roads built in the United States using the flat iron bar, about 2 1/2 inches by 3/4 inch, nailed to wooden rails, and the English continuing to use the chair and wedge. My uncle always regretted that he had not patented his invention. He mentioned to me, upwards of forty years ago, that when advised by his friend, Mr. F. B. Ogden, the American consul at Liverpool, who was familiar with the circumstances of his invention, to patent it, he found that it was too late, and that his invention had become public property. This 1870 map of the Camden & Amboy shows the line just before it was leased by the Pennsylvania Railroad in 1871. 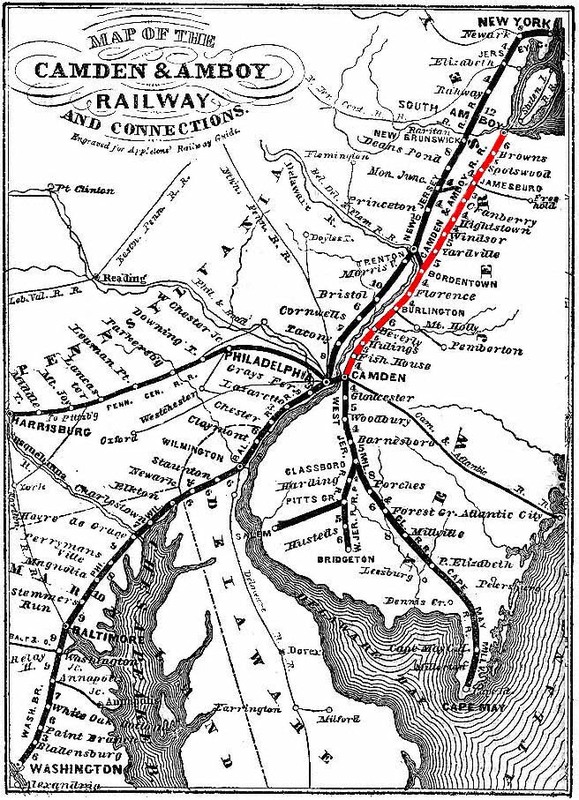 The original 1834 line is indicated in red. Courtesy Bruce C. Cooper Collection. "In 1832 the Camden and Amboy Route was from South Amboy to Bordentown with boat connections at both ends. The motive power was teams of horses which were changed three times enroute. The John Bull made its first cross state trip in 1833. Service was extended from Bordentown to Camden in January 1834. By 1834 there were three daily round trips, two by horse teams and one by iron horse. At that time the fare was two dollars for the slower horse drawn trains and three dollars for locomotive hauled trains. ... In R&LHS Bulletin No. 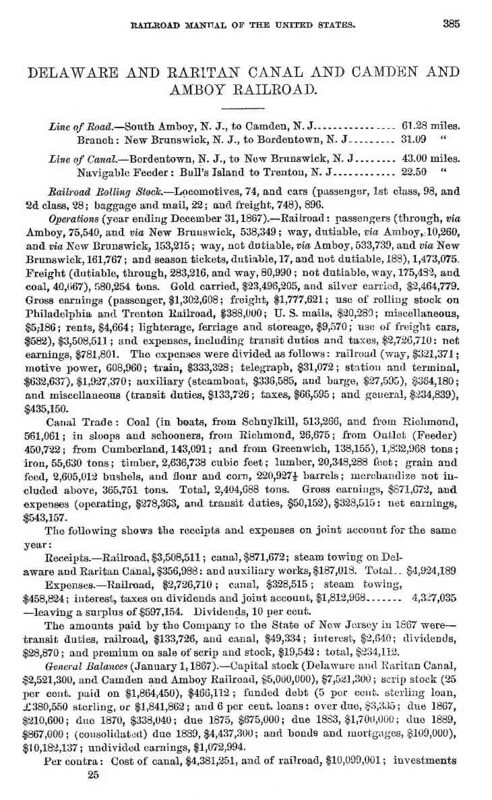 88(May 1953), a lengthy article on The N.J. RR & Transportation Co. by Leslie Freeman on page 126 he notes the fare between New York and Philadelphia in 1839 over the all rail route was $4.00 one way with the journey taking five and a half hours." —Joel Rosenbaum, from the R&LHS Newsgroup.